Oh boy! Get ready for another controversial segment of Church history to be debated this year. 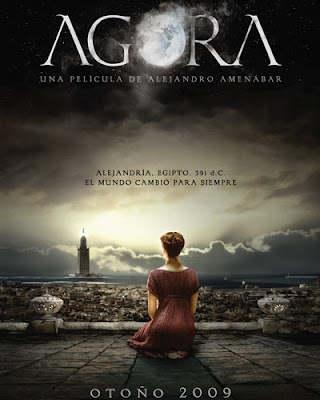 At this years Cannes Film Festival there was a gala red carpet screening for a movie about the notorious pagan philosopher Hypatia of Alexandria titled Agora. The film is directed by Alejandro Amenábar -- director of The Sea Inside (2004), The Others (2001) and Open Your Eyes (1997), the last of which was remade as Vanilla Sky (2001) -- and interestingly stars Rachel Weisz who plays Hypatia. According to IMDB.com, it is slated for release on December 18th of this year. The same site gives the following synopsis. "A historical drama set in Roman Egypt, concerning a slave who turns to the rising tide of Christianity in the hopes of pursuing freedom while also falling in love with his master, the famous female philosophy professor and atheist Hypatia of Alexandria." To get my positive remarks out of the way, I must say first of all that the cinematography looks impressive. And the topic of Hypatia of Alexandria for a film is an interesting idea. Did I mention the cinematography looks great? Ok, I find it hard to get excited about this film. I already see yet another rewriting of history to fit someones agenda and make an otherwise fascinating true story into something that is relevant for today, yet lost in the mythology of modern storytelling. To be fair however, I have not seen the movie and it is too early to say just how this movie will approach the material. From the synopsis of the film a few errors can already be pointed out. The slave mentioned is a character named Orestes, who is played by Oscar Isaac and previously starred in The Nativity Story (2006). Historically Orestes was not a slave, but the Imperial Prefect of Alexandria. I hope that they do not show a love affair between Orestes and Hypatia because Hypatia was a virgin for the sake of intellectual pursuits and was noted many times for shunning all advances made by hopeful suitors - to the point where she would even show them her menstrual rag to turn them off! I find it curious that they describe Hypatia as an atheist. As far as I know, there is no evidence to suggest she was an atheist. As a Neoplatonist she almost surely believed in a god, and most histories even refer to her as a pagan. According to the director, the film is primarily an attack against fundamentalism. Could it be then that in order to make this film relevant to contemporary issues, the writers really made this film fit into a clash between atheism and fundamentalism, science and faith? I have little doubt. Do atheists and materialists have to dig so deep as to mythologize history in order to create its martyrs? Apparently so. According to IMDB.com, Sami Samir is slated to play St. Cyril, Patriarch of Alexandria. He also was in The Nativity Story as the thief on the Cross. Most historians have a very biased view of Cyril when it comes to his relationship with Hypatia. In fact, they accuse him of instigating a Christian mob to kill her by tearing her to pieces. If the majority of historians are biased, I can only suspect this film will be too. The fact of the matter is that one pagan historian of the time found an opportunity to accuse the Christian Patriarch of the murder, and slandered his name. No other historian seems to mention this, but modern historians tend to lean towards the more seedy tale and promote it as truth. There is not even a verifiable historical link between St. Cyril and the murder of Hypatia. The truth of the matter is that the most reliable historical witnesses mention that the Christians of Alexandria admired Hypatia. Yet, as the 5th century historian Socrates Scholasticus states, Hypatia "fell victim to the political jealousy which at that time prevailed". Hypatia was not killed by religious fanatics who wanted to kill an intimidating intellectual woman, or an atheist or even a pagan. Hypatia was killed by a mob that happened to be Christian, as most were in Alexandria at the time, because the mob believed she helped fuel a division between Cyril and Orestes. 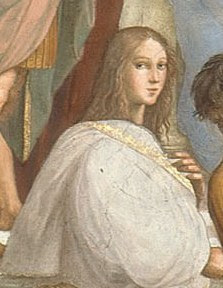 Orestes, a Christian himself, had tried to silence the voice of Cyril in secular matters out of jealousy, and Hypatia, as a non-christian pagan, supported Orestes. This caused some over-zealous Christians who supported Cyril to seize her and kill her in retaliation for the murder of Monk Ammianus who threw a stone at Orestes and ignited his wrath. It should be pointed out that historians of the time mention that both Pagans and Christians of the time in Alexandria tended to be over-zealous in political matters and Christians were still being murdered there at larger rates by Pagans and Jews then vice versa. In other words, the murder of Hypatia was caused by fanatics on a political rather religious level. It will be interesting to see how Agora will treat these very sensitive historical matters. Most interesting of all is how they will depict St. Cyril and the conflict between science and faith. With Rachel Weisz in the picture this multi-million dollar film will surely get at least a moderate release, enough to ignite some controversy and discussion in these matters.